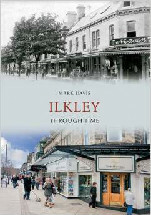 A fascinating selection of photographs traces some of the many ways in which Ilkley has changed and developed. During her rise to fame Ilkley was often described in romantic terms by the Victorian traveller. Home to the oldest literary festival in the North of England Ilkley is clearly characterised by her Victorian architecture. Situated in the heart of Wharfdale, she is as pleasing to the eye today as she was a century ago. Through an enticing collection of photographs we explore how this fashionable spa town with its enchanting local scenery has grown in popularity. Mark Davis touches on the rich heritage that links Ilkley to the famous Hydrotherapy introduced in 1843 and the English Naturalist Charles Darwin. Ilkley was to firmly establish herself as an extremely popular spa and recreational town of the railway age. Such was her notoriety the Victorians were easily enticed in their droves to take in the pure and abundant springs alongside the open moorlands and green meadows.